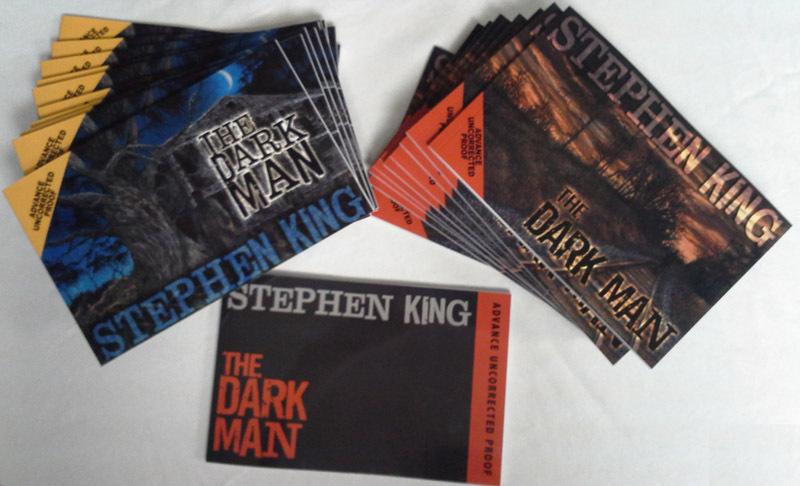 The review copies for The Dark Man by Stephen King arrived on Friday. Also pictured is the interoffice proof that is not for review or distribution — it was produced before we had the final cover artwork and was solely meant to give us a better feel for how the final book would look when printed, so we could adjust the pages and artwork as needed. How Do You Deal With Reviews? I so want one of these. It is my dream to one day publish with CD. I love you guys!! They look cool. Is there any difference in the two ARC’s besides the cover? Good question. They are the same. We just used the slipcase edition’s cover for some of the ARCs. They look great! I saw people on the cemetery dance forum talking about getting a copy. How do you get a copy of the ARC? Are you still giving them out? I’ve got a signed limited on the way, but can’t wait to read this! We gave a few away in a contest, but most go to reviewers and booksellers!